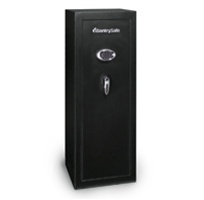 SentrySafe Extra Tall Security Gun Safes: 64 inches high, 14-gun safes allow for added interior storage. 2 adjustable shelves provide flexibility to store your necessary gun equipment. Available with combination or electronic lock, steel live-locking bolts and durable black powder coat finish. Capacity: 10 cu. ft. 0 cu. in. Ship Weight: 195 lb. 88.5 kg.